Posted on March 5, 2015 at 10:02 am. Two of Microgaming’s most popular and reputable online casinos have made some welcome changes to their instant play desktop casino interfaces. Royal Vegas Casino and Casino-Mate both now utilise a browser-based interface which closely resembles that of their full casino suite software download versions, making the player’s online gaming venture feel more like a complete casino experience. 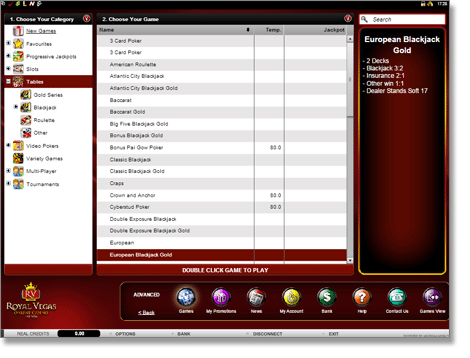 The instant play gaming interface of both Royal Vegas Casino and Casino-Mate now have unique sections dedicated to the display of games, a unique games view list (which lists and describes all available real money titles), promotions, news, account details, banking, a help and rules tab and support. The instant play style of gaming has become more and more popular with the rise of better browser formatting technology such as HTML5, Flash and Java, and websites are now able to power interactive features which many people originally thought were only possible within dedicated downloadable software. However, it appears with this growth in graphically-advanced technology, browser-based gambling sites are now surpassing their software counterparts in terms of interactivity and visual effects, and more players are inclined to play games directly via the Internet. So Royal Vegas and Casino-Mate have been able to significantly revamp their Web browser gaming sites, while still keeping them different from many of the other online gambling websites across the World Wide Web. With access to a wide range of new features previously only available via their full casino suite software, instant play players now have a wealth of casino fun, including fresh promotions, tournaments and online gambling news at their fingertips. Register an instant play Royal Vegas Casino account or Casino-Mate account and check out the new and improved browser-based websites. When you first log in to your account directly via the Internet, the display of games will be shown neatly in 10 different categories: New Games, Favourites, Blackjack, More Tables, Multiplayer & Tournaments, Jackpots, Classic Slots, Video Slots, Video Pokers and finally, Variety Games. Have a specific game in mind, though? Want a brief summation of the rules of a specific title? Or do you want to take a look at the entire catalogue of titles via one convenient page? That’s what the Games View is designed for. Here, you can type in the search bar a certain game you may be looking for, browse over the basic rules for each and every game, or you can browse through the entire 500+ casino titles available for Australians to play in real AUD money. Within the instant play interface, you have direct access to current news (recent winners and any other important changes in the online gambling community) and promotions and bonuses on offer (welcome packages, free spins, cash prizes, daily, weekly and monthly promos). Players can also easily access their account details to view and redeem Loyalty Points, change their password if required, view game history, and more. Within the banking section, players can quickly and securely make deposits and withdrawals via one of several different Aussie-friendly methods, such as credit and debit cards, e-wallets, direct wire transfers and pre-paid cards and vouchers. The help tab provides all the information and rules you’ll ever need for every individual game, details about the casino, how to deposit and withdraw cash, payout rates, and anything else you can think of. The contact us tab displays all ways you can get in touch with the staff at Royal Vegas Casino, including email, live chat and toll-free phone numbers. Under options, you can change the language settings, turn the sounds on or off, and have the casino log in for you when you open the website. 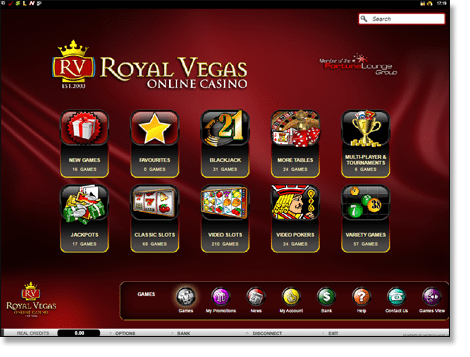 Sign up at Royal Vegas Casino and let us know what you think of the improved browser-play casino interface. Check out the high quality games and enjoy the perks of gambling online.